Officers of the National Drug Law Enforcement Agency (NDLEA), Edo State Command, have burst a warehouse at Ugbubezi forest in Owan West Local Government Area of the State, stored with large quantity of harvested dried weeds of cannabis sativa, popularly known as indian hemp. 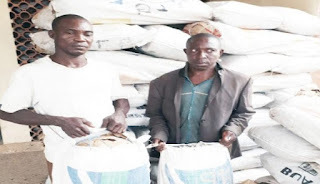 Ofoyeju Mitchell, Principal Staff Officer Public Affairs, for the anti-narcotic agency in Edo, said in a statement that the illicit drugs, compressed in 34 bags with a total weight of 1,996kg, were evacuated from the warehouse by 70 officers of the agency. “The estimated street value of the drug is N20million, even as two suspected members of the drug cartel working at the warehouse were also arrested”, he said. Ofoyeju quotes Wakawa Buba, NDLEA Commander for the State as saying that the seizure was a great way to start the year. His words: “Working on intelligence, we successfully traced a major cannabis warehouse located in Ugbubezi forest in Owan West Local Government Area. Two suspected members of the drug cartel were also arrested and currently being interrogated”. He added that dispossessing the cartel of drugs valued at N20m was a good take-off for the year and a major boost for the 2018 operational year, as the agency is poised for a total offensive against drug trafficking cartels in Edo. But, the suspects, who claimed they were farmers, blamed their involvement in drug trafficking on poverty. Augustine Egwutu, 45, one of the suspects, married with three children, said he used to cultivate plantain and pepper, but wildfire engulfed his farm and he lost everything. “I could not feed my family and my landlord threatened to evict me for not being able to pay my rent. This was the reason that made me go into cannabis business” Egwutu stated. » "How I Kidnapped My Employer’s Son And Demanded N20m Ransom"